What better way for three hot Langstonedale girls to spend a warm Summer afternoon than by taking a beautiful mudbath together, while all three are dressed in skin-tight athletic exercise gear? 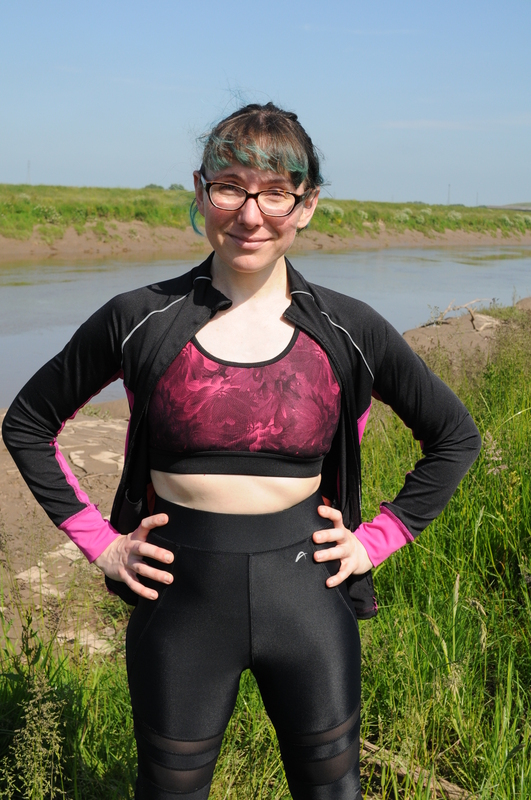 Cindy wears some very sophisticated shiny black running pants with mesh details, plus a black and purple sports bra top, with a thin running jacket, worn open, over it, and black sports shoes. She steps into the mud first, gets stuck, sits down, though not yet in the sloppiest part so while her shiny pants get marked they don't yet get fully coated, then works her way down into the very sloppy section and starts to realy get covered in mud, including lying on her side and then rolling forward into the liquid mud so we get to see the engulfing the front of her trousers as she rolls into it. Cindy plays in the mud on her own for a little while, and then Honeysuckle appears and joins her. Honeysuckle wears plain skin-tight black running trousers and a hip-length runners' top, with a short denim jacket over it, and trainers. She walks down into the mud to join Cindy, and soon her nice exercise outfit is also getting covered in mud, as Honeysuckle cheerfully slides down into the sloppy mud while Cindy enthusiastically helps her into the muck. The two of them play in the mud together, getting more and more covered, including Cindy taking her jacket off so Honeysuckle can really give Cindy's bra top a good seeing to, and then eventually Felicity appears at the top of the mud banks, and wades in to join her friends. Felicity wears a lovely all-matching dark green and black "jungle print" running outfit, skin tight capri length leggings and hip-length sleeveless top with see-through mesh at the back, and black pumps, and needless to say, as soon as she joins the other two her nice clean outfit begins to suffer as both the other girls throw mud at her, then help her down into the liquid mud at the gully bottom, and she gets totally covered. Once all three are well covered, they play about in the mud with each other, then clamber and slither up the bank, and slide down into the next gully, they also completely cover each other's hair, and cover their faces in mud war-paint.